Especially in our joints, and especially as we age or injure ourselves. Whether through heavy activity or everyday tasks, it's often our Elbow joints that begin to suffer and ache. PowerLix has taken the time to develop a specialized fabric blend with 4 way stretch capability, offering all around superior protection and support above and beyond what you've experienced before! The breathable fabric, absorbs sweat quickly and keeps your arm dry and odor free, allowing you hours of continuous use! ✔ 4-way compression sleeve ergonomically designed for full range of arm motion and full protection. ✔ Special fabric gives you a smooth and soft touch feel all day and all night long! ✔ Significant pain relief from a variety of ailments including Tennis & Golf Elbow, tendonitis, joint inflammation, swelling, and other Elbow pain. ✔ Special knitted technical design that matching different joints. ✔ Designed to Increase your performance while ensuring you're a step ahead in injury prevention! Take a look at our sizing chart, and pick the best one for you. Best of all, even if you don't pick the right size, we will make sure to replace it. We're so sure you'll love the PowerLix Elbow Braces that we offer a 100% Money Back Guarantee for 6 months. If for ANY REASON you don't like it, we'll refund every penny with no hassle. PHENOMENAL PROTECTION: PowerLix Elbow braces apply stable pressure across your elbow joint, which provides ultimate pain relief from a variety of ailments including tendonitis, joint inflammation, tennis elbow, golf elbow, and other elbow pain. With our sleeves you'll be able to tackle any activity life throws your way, while ensuring you're a step ahead in injury prevention! PLEASE TAKE A LOOK AT OUR SIZING CHART AND MEASURE YOUR CIRCUMFERENCE BASE ON OUR INSTRUCTIONS! PUSH YOURSELF TO THE LIMIT! 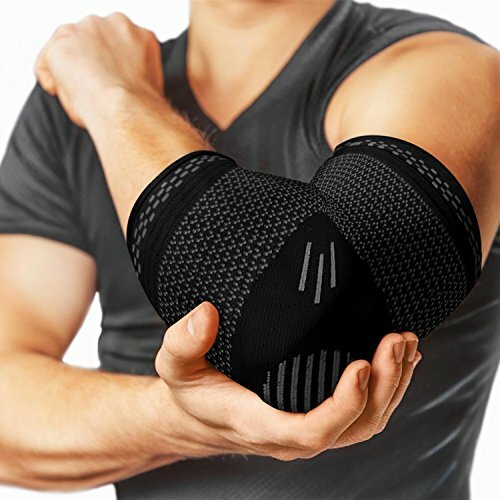 : Our Elbow supports are the perfect fit for any activity that involve a great amount of stress on the joints like, Tennis, Golf, Baseball, Basketball, Crossfit, Weightlifting / Powerlifting, Volleyball and more! You'll be able to enjoy exceptional elbow support while still maintaining your peak performance and full range of arm motion! PREMIUM QUALITY: Our Elbow sleeves are manufactured to provide superior support, comfort, and relief without compromising your mobility. Tight, form fitting, and breathable compression fabric maintains joint stability regardless of activity, helps improve blood circulation and eases pain while avoiding the itchiness common to neoprene supports. Quick at absorbing sweat and keeps your arm dry and odor free, gives you hours of continuous use! BREATHTAKING DESIGN & ANTI-SLIP SYSTEM: Special knitted technical design, ensuring your sleeve stays always put, no matter what you do! The beautiful design of the sleeves in blue & black makes you look fashionable anywhere anytime. The special fabric gives you a smooth and soft feel so you can wear them all day long! 100% MONEY BACK GUARANTEE- We truly want you to be happy with your new Elbow braces and our professional customer service will do whatever it takes to ensure your satisfaction, we are offering 6-month guarantee, no questions asked. If you have any questions about this product by PowerLix, contact us by completing and submitting the form below. If you are looking for a specif part number, please include it with your message.